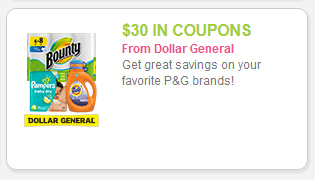 Get $30.00 worth of great savings on your favorite P&G brands at Dollar General! Sort coupons by Household to find the above coupon more quickly. Savings also includes a coupon for $5.00 off your purchase of $25 or more (pre-tax) at Dollar General on Saturday, May 17, 2014. Take a look around for more coupons you can use on coupons.com, there are close to 400 coupons worth over $700.00 to choose from. That’s more than you get in the Sunday Newspaper.